All parents love to surprise their offspring with presents. 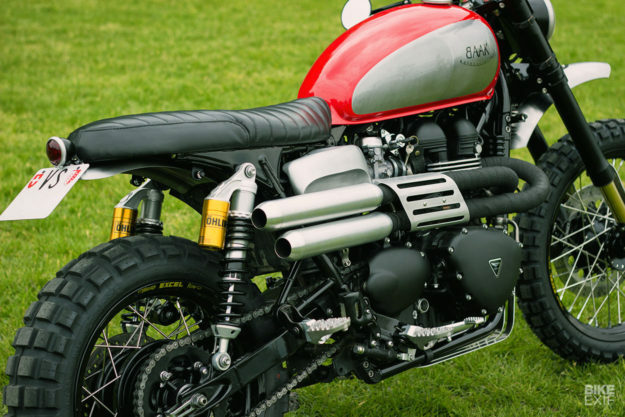 But how often do those gifts take the form of a bespoke motorcycle? Thierry and his son Nelson like to ride together around their home country of Switzerland. 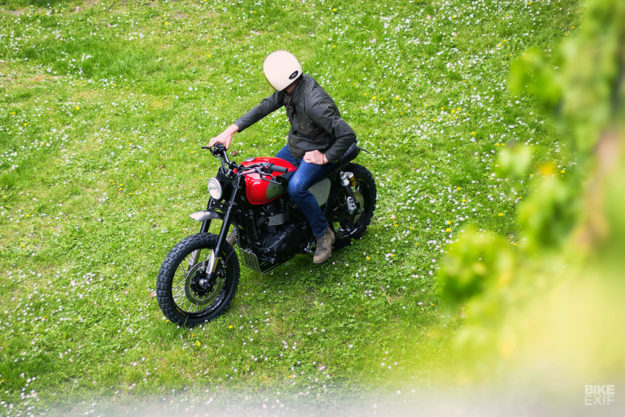 And then Thierry decided it was time to surprise his son with a new ride, so he rang up BAAK Motocyclettes of Lyon, just over the border in France. 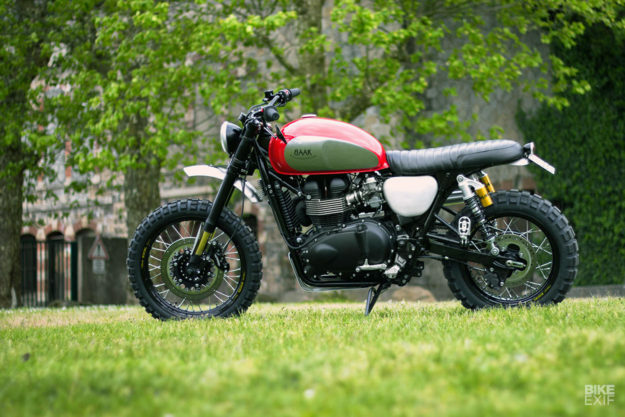 The brief called for something both classic and contemporary, so choosing a 2016 Triumph Scrambler as a donor was a no-brainer. And settling on the style turned out to be painless, too. Thierry’s a fan of the Bultaco trial bikes of the 60s and 70s, and still owns one. 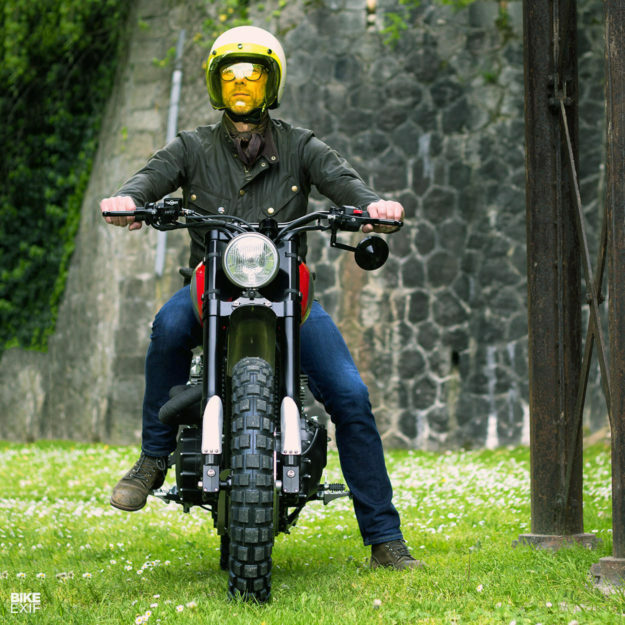 As it turns out, BAAK shop boss, Rémi, also owns a Bultaco—a 1974 Sherpa 350 Kit Campeón that he still rides and races. 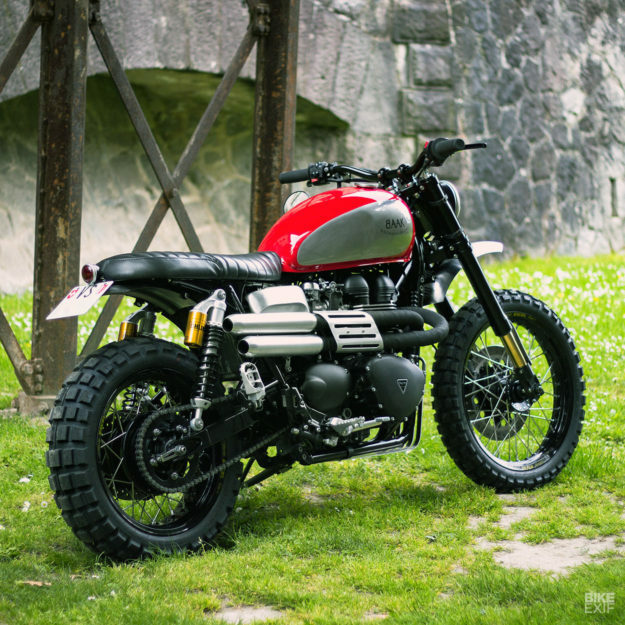 The two hit it off immediately, and decided to add a little Bultaco flavor to the Scrambler, by sampling the Spanish marque’s classic red paint color. 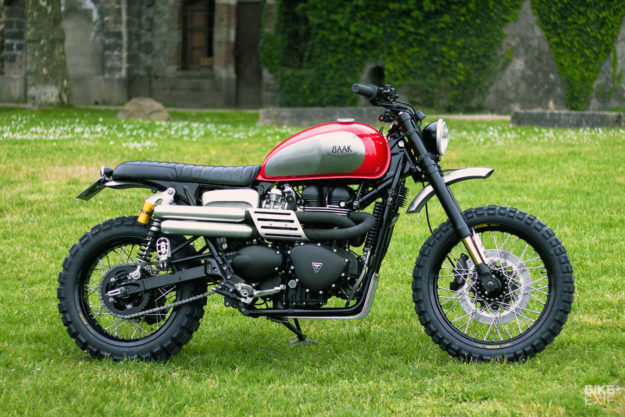 But this Scrambler is more than just a slick paint job—BAAK also set out to amplify its dynamic qualities as much as possible, turning it into a real ‘sleeper’ custom. It started with a full suspension package from Öhlins, with new shocks out back and a set of upside-down forks in front. Next they laced up a set of aluminum Excel rims—to improve durability and shed a little weight. 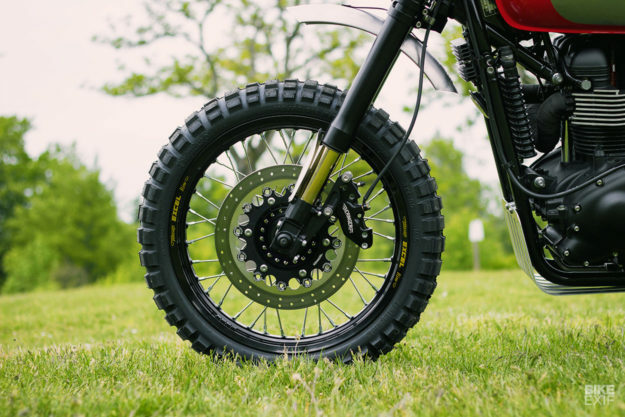 They’re wrapped in Continental TKC80s, striking a compromise between asphalt and dirt riding. 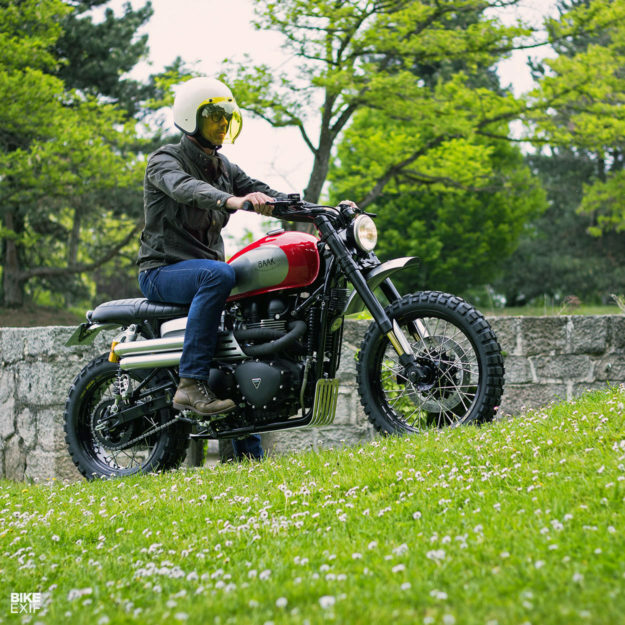 All the quintessential scrambler touches are present—like the high-riding twin exhaust system. Stainless steel headers run into a pair of machined aluminum mufflers, and the system’s topped off with a custom heat shield to keep the rider’s leg cool. The crew also fabbed up a pair of aluminun side covers to replace the dinky plastic ones, and added their own short and high front fender. A lot of what you see here is actually available in BAAK’s rapidly growing catalog of bolt-on parts. So you could, in theory, build a similar bike yourself (and then give it to your son). They’ve installed their sump guard, ignition relocation kit, and a neat headlight plate that attaches via leather straps (it sits behind a 5¾” Bates-style headlight). The rectifier has been relocated, and there’s a single mirror hanging from the bars. The Scrambler’s also sporting new machined yokes to hold the burly forks, new handlebar risers and a new set of bars. 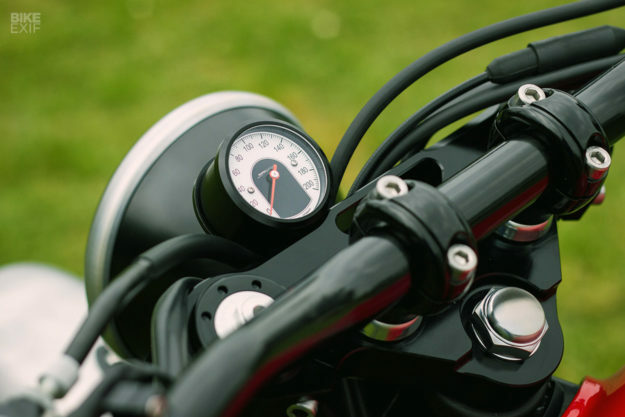 There’s a Motogadget speedo, and Motogadget turn signals at both ends, mounted discreetly on custom brackets. A set of one-off aluminum fork guards, and a full set of off-road pegs for rider and passenger, round out the package. 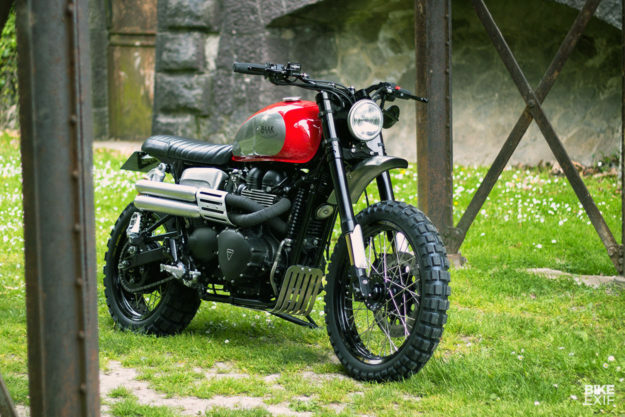 BAAK’s well-judged set of changes have turned an already attractive motorcycle into something truly memorable. They’ve covered all the bases—from lazy cruises with a passenger to fun off-road sessions. Looks like Thierry and Nelson have some serious qualité time lying ahead of them, doesn’t it?